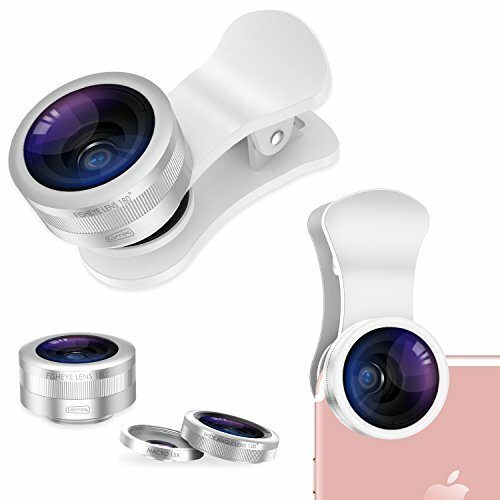 【Camera Lens Kits】: 3-in-1 cell phone camera lens set includes a 180° Fish Eye Lens, a 120° Super Wide Angle Lens and a 15X Macro Lens, all lens are crafted with alloy metal and high class multi-element coated glass to minimize reflections and lens glare, bringing you high quality technical image effect. 【Widely Compatible】: Can be suitable for iPhone 7, iPhone 6s, iPhone 6 Plus, iPhone 6, iPhone 5s, iPhone 5, iPhone 4 and more android smart phones that the distance between camera and the edge of the cell phone is no more than 3 cm. 【Lens Function】: Macro lens gets 15X closer to your subject for extreme close-ups, Wide Angle Lens opens up your field of view for breathtaking landscape photos or selfies, Fisheye lens can give you super wide angle for 180° and bring you much more fun on your trip. 【Best Choice for Gift】: High quality phone lenses with an exquisite packing box which is the best gift for yourself, girlfriend, wife, daughter, boyfriend, husband, son or friends who like photography. 【Quality Assurance】: TORRAS brand multifunctional phone lens is produced under strict quality inspection, Super quality for you, 12-Month Worry-Free Warranty.